On Wednesday evening I was the guest speaker for the Sespe Flyfishers at their monthly meeting in Ventura. I presented photos and video of fish in the Ventura river, and a discussion of how water supply, water quality, flood control, land use, fishing, etc affect this endangered species. My presentation illustrated many issues in the watershed through photos and news clippings. 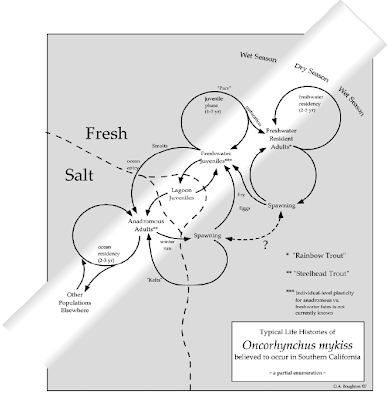 Most of these problems are included in the Southern California Steelhead Recovery Plan, now available on the NOAA website here. LAND USE: erosion and sedimentation of river and stream channels, and remaining estuarine habitat. 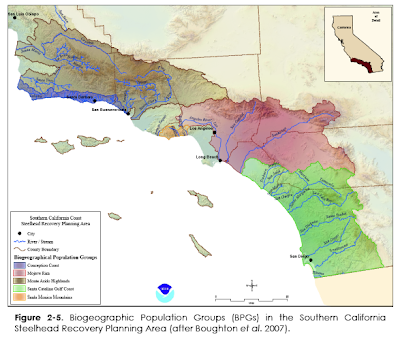 The Ventura River is identified as one of the primary core populations and recovery priorities for the southern steelhead. Specific actions for the Ventura River include removal of Matilija Dam and modification of flows. The public comment period for the Southern California Steelhead Recovery Plan has been extended to *November 19, 2009*.